John Crewe was the eldest son of six children to John Crewe, a politician, and Anne Shuttleworth of Gawthorpe, and although little is known about his childhood at the time this portrait was painted by Spencer, he went on to become a successful politician, following in his father’s footsteps, and a leading agriculturalist. John Crewe the elder had been MP for Cheshire from 1734 until his death in 1752. His son matriculated from Oxford and completed a Grand Tour of France and Italy, where he was painted by Pompeo Batoni, before being appointed the High Sheriff of Cheshire in 1764. He then entered politics as a Whig member for Stafford in 1765. Crewe married the society beauty Frances Anne Greville in 1766 who was painted by Sir Joshua Reynolds on two separate occasions in her youth and was good friends with the playwright Richard Brinsley Sheridan, who dedicated his play A School for Scandal to Frances. John and Frances Crewe went on to have four children, two sons and two daughters. In 1768 Crewe returned to Cheshire and was elected MP, a position he held for 34 years. Although Crewe rarely spoke in the House of Commons, he is best known for Crewe’s Act 1782 which prevented customs officers and post office officials from voting. It was hoped that preventing high up officials in public services from voting would prevent corruption during election-time. John Crewe was made a Baron in 1806 for his loyalty to parliament and in particular his loyalty to Charles James Fox. He died at the age of eighty-six in London and his son, also John, became 2nd Baron Crewe. Like Crewe, little is known of Gervase Spencer’s early life and it is believed that he commenced his career as a footman, amusing himself with drawing only as a hobby. It was common in the first half of the eighteenth-century for miniaturists to have no formal training but as Spencer began working in enamel, a highly skilled medium prone to cracking, he almost definitely would have been trained. There were no public exhibition spaces when Spencer started his work as a miniaturist and it was only when the Society of Artists first opened in 1761 that Spencer was able to exhibit there for the last two years of his life. It is not known whether Spencer trained several pupils but one of them was certainly Henry Spicer who later painted Sarah Siddons [previously with Philip Mould & Company]. 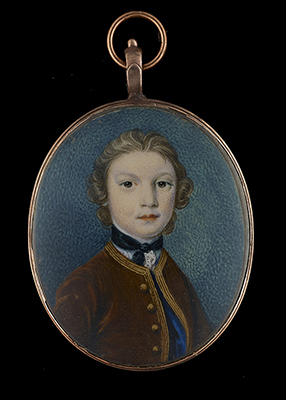 This portrait miniature thought to be of a young John Crewe, dressed in a brown coat bordered with gold, is typical of Spencer’s style of ivory miniatures dating to the late 1740s and 1750s, including his self-portrait, 1749, now in the Cincinnati Art Museum. Many works by Gervase Spencer exist in public collections all over the world.